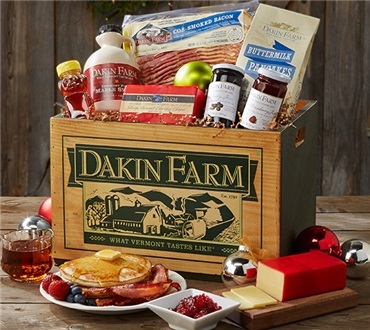 This gift is bursting with North Country delicacies. We love to share this classic selection of Vermont's finest with our family and friends. Choose the "Jumbo" packed in our distinctive gift box. The gift is packed in our traditional gift packaging. If you would like it packed in the Dakin Farm Wooden Box please select the Wooden box option from the drop down below. Arrived well packed. Nice presentation. Love the Wooden Box! I have been sending the Lumberjack to my family 1200 miles away for several years now with great reviews. More than a meal for the whole family and they need to spread it over two days. Always enjoyable! I've received this same gift for the past 2 Christmas' - love it. Love the variety of foods and the flavors are wonderful. This year's bacon was not sealed. There was air in the bag. Not sure if it's still good - will see in the morning when I make breakfast. Well worth the gift though. Hope to continue to receive this every year. Love the wooden box too - very useful around the house.